Best part: Coogan and Dench’s chemistry. Worst part: The wavering messages. From Philomena‘s opening frame, its pressing arguments and perspectives fascinated me. I’ll explain why, despite my obvious and enthusiastic subjectivity, by deliberating on journalism itself. As one of history’s most intriguing and necessary professions, great journalistic endeavours, as Philomena suggests, can destroy organisations, illuminate fascinating people, and build glorious monuments to human potential. However, as this dramedy proudly asserts, harmful preconceptions and controversial actions destroy journalism’s reputation. 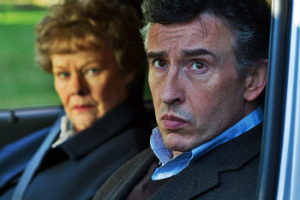 Despite Philomena‘s wavering viewpoints, journalism’s overwhelming power and influence turns this dramedy’s weakest aspects into intriguing intricacies. To define this argument, I’ll deliberate upon the media’s involvement with Philomena‘s creation. In 2009, polarising British actor/comedian/ writer Steve Coogan looked through the Guardian Weekend Magazine’s online hub. While net surfing, he found one of notorious journalist Martin Sixsmith’s human-interest articles. The article, The Catholic Church Sold my Child, remarkably transfixed Coogan beyond online media’s boundaries. After reading Sixsmith’s book on the same subject, The Lost Child of Philomena Lee, Coogan obtained the rights. Coogan’s immense pride and valour become cognitive to this adaptation’s production. Based on Sixsmith’s intensifying words, Philomena is an impactful, charming, and distinctive dramedy. The movie immediately solidifies this story’s emotional stranglehold. Sixsmith (Coogan), at his general practitioner’s office, delivers reasons for his significantly morose state. Fired from a Labour government adviser position, Sixsmith faces damaging legal issues. With government and media officials staring him down, his reputation needs a conquering boost. Conversing at a friend’s party, he discovers a meaningful article idea. The movie then leaps into Philomena Lee(Judi Dench)’s haunting life story. With flashbacks revealing her heart-aching journey, her elderly self is a repressed and stupefying individual. Conversing with Philomena and her daughter Jane (Anna Maxwell Martin), Sixsmith discovers this story’s glorious potential. Travelling across Britain, Ireland, and the USA, Sixsmith and Philomena become contrasting yet inseparable buddies. Despite the tiresomely cliched premise, the movie examines the story’s punishing twists and turns. Receiving disgraceful condemnation from critics and the Catholic Church, Philomena organically shifts from comedically fruitful road-trip dramedy to heart-breaking mystery. Thankfully, it’s never afraid to be honest, thorough, and revelatory. The narrative, fuelled by comedic sensibilities, hurriedly delves into the story’s broadly accessible aspects. Certain scenes, peppered with awkward silences and cutting dialogue, establish this situation’s blatant absurdity. Here, Sixsmith’s perspective becomes a stable and likeable resource. Sixsmith’s motivations, turning friends into enemies, are presented as cynical and disenfranchising facets. In the first third, the story divulges into clues and characters important to Philomena’s horrifying ordeal. Handling unique characteristics, the narrative distorts and enhances road-trip comedy cliches. Replacing cars with planes, this journey turns into a haunting and expansive odyssey. Sixsmith and Philomena, divulging into deft exposition and thought-provoking revelations, bond over this expansive research project. Director Stephen Frears (High Fidelity, Dangerous Liaisons) thoughtfully examines potent human connections whilst leaping between genres. With valuable docudramas, romantic adventures, and kinetic comedies outlining his filmography, Frears’ style combines range and intelligence. Here, he becomes startlingly infatuated with the main characters. Shifting gracefully from comedic hijinks to sickening darkness, his movie illuminates life’s most ingenious and refreshing moments. Surprisingly, this Best Picture nominee contains other contenders’ tropes. Featuring a discomforting road trip (Nebraska, Inside Llewyn Davis), wacky character relationships (Saving Mr Banks), and socio-political messages (Dallas Buyers Club), this entertaining concoction becomes the Weinstein Company’s pet project. “But I don’t wanna hate people. I don’t wanna be like you. Look at you.” (Philomena Lee (Judi Dench), Philomena). On celluloid, Catholicism, journalism, and odd-couple relationships are meaningful and understandable subjects. This movie, righteously and ambitiously, delves into all three topics. From the hysterically witty opening, the movie states and examines its blunt agenda. Establishing its lead character as a brash and abrasive journalist, this docudrama almost delves into heavy-handedness and cynicism. Unafraid of criticism, the movie delivers vicious editors, scandals, and the ratings vs. integrity debate. Despite presenting multiple perspectives, the movie hurriedly changes its mind at opportune moments. Not to be outdone, the movie’s atheism vs. religion debate is an affectionate and thought-provoking strand. As this heart-breaking narrative’s twists are unveiled, religion’s pros and cons become vital to Philomena’s character arc. With the convent becoming a prison-like fortress, the nuns are necessarily depicted as horrific cretins. Shockingly, we become valuable witnesses to 50-year-old crimes. Ethics, principles, and convent rules are strictly enforced by Philomena’s church. Despite prejudices and cultural indifference, organised religion viciously clashes with modernity. Despite the rich subjectivity, the movie’s gripping conclusion allows for unique and dexterous interpretations. Despite its intelligent viewpoints and phenomenal plot-strands, the two lead actors heartily grapple this project. Drawing large audiences into this well-meaning dramedy, the two leads lend wit, charm, and malice to this unforgettable story. Coogan, a discomfortingly polarising comedic actor, becomes a delightfully brash presence here. As a writer, producer, and lead actor, Coogan’s intentions and verve are mercifully injected into the final product. Here, his sarcastic aura boosts this enjoyable narrative. Playing a psychologically and morally damaged character, Coogan elevates this familiar role. Alluding to the News of the World scandal, the character conveys Coogan’s agreeable viewpoints and forceful determination. 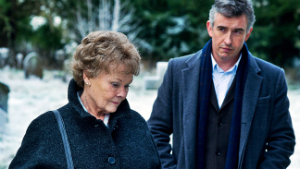 Delivering another Oscar-worthy turn, Dench launches head-on into Philomena’s destructive journey. Dench, as this sympathetic character, lends tangibility and potency to confronting revelations. In addition, without being irritating, Philomena becomes a wide-eyed companion for the world-weary Sixsmith. Explaining tiny details about loveable novels, her optimism and glee deliver several hysterical moments. Like most travellers, Philomena’s curiosity pushes her through pressing situations. 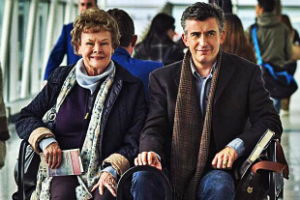 Despite the wavering agenda and conventional road-trip narrative, Philomena contains enough charm, laugh-out-loud moments, and emotionally powerful surprises to elevate it above similarly light-hearted dramedies. Outdoing their previous performances and dramedies, Coogan and Dench become an intriguing, eclectic, and comedically savvy duo. This odd couple – arguing incessantly over politics, ethics, religion, and personality ticks – delivers understandable moments and heartening identities. 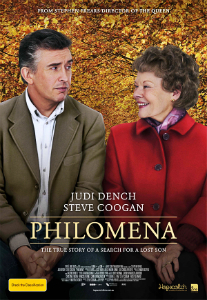 As this Oscar race’s dark horse, Philomena is charming and appropriate enough to compete with its enrapturing competition. Verdict: An enlightening and impactful dramedy.